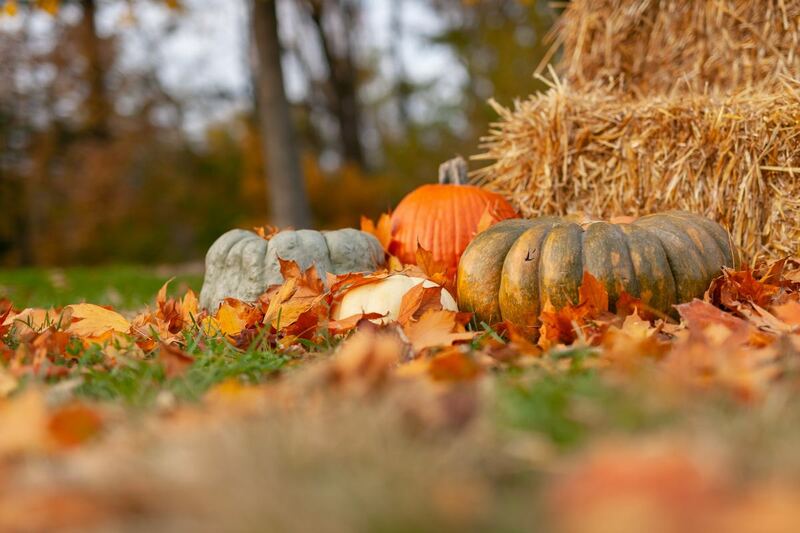 While all of the many decorative pumpkins that once graced just about every garden nursery as well as grocery store in the Autumn season of the year are long gone, one need not forget the pumpkin and what can be done with this ingredient until next year. 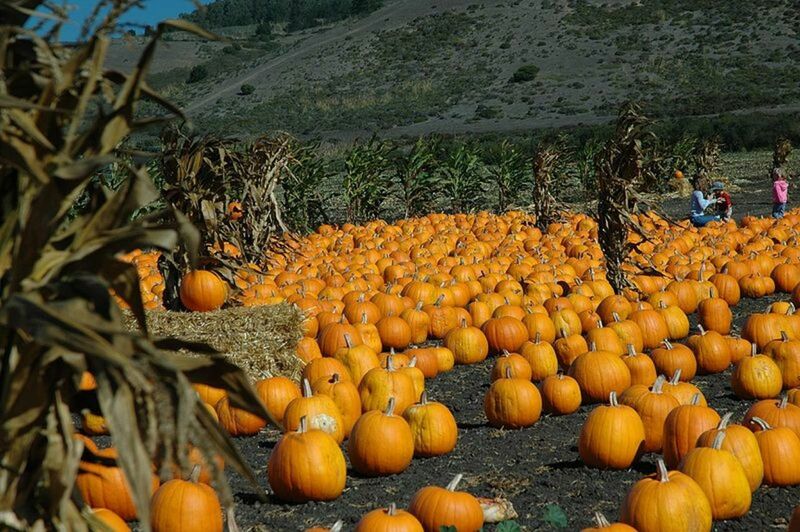 Who can forget those annual pumpkin patches in church lots where families traditionally take their small children for photo opportunities before taking home a chosen pumpkin to draw upon or carve for Halloween festivities? Just like the sweet photos that can be enjoyed long after the day of photography has passed, fortunately for us, seasonal, fresh pumpkins are also typically preserved by canning and are available to us year round. I was going through my mother's recipe files yesterday and came upon a pumpkin bread recipe given to her by one of her good friends who used to live in San Antonio, Texas and whom I had met. I decided to try it and it turned out to be a delicious "keeper" recipe. I know that I will be making it again and thought that I would share it with you. It is easy to find many well written excellent articles pertaining to the health benefits of both the pumpkin and also its seeds, so instead of recanting those statistics, suffice it to say in brief that pumpkin...like it says right on the Libby can...is an "Excellent Source of Vitamin A & Fiber" and is also "Low in Calories & Fat." 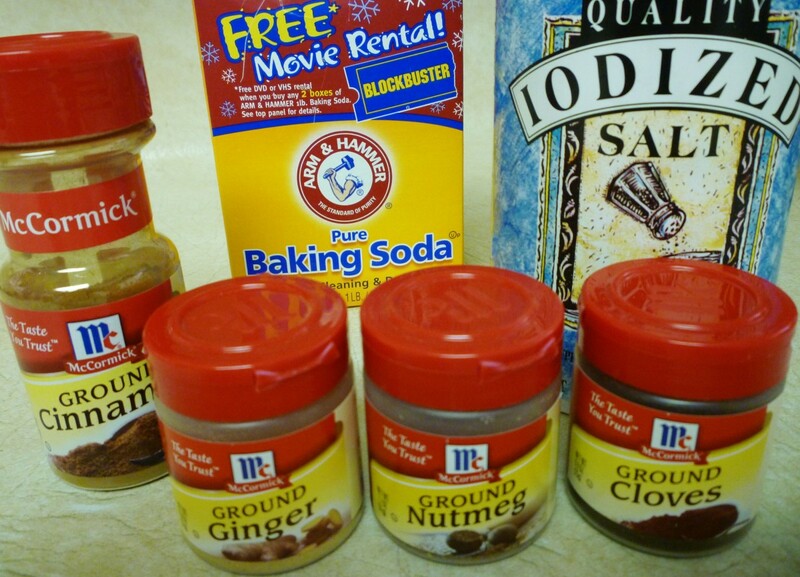 Some of the ingredients for making pumpkin bread. 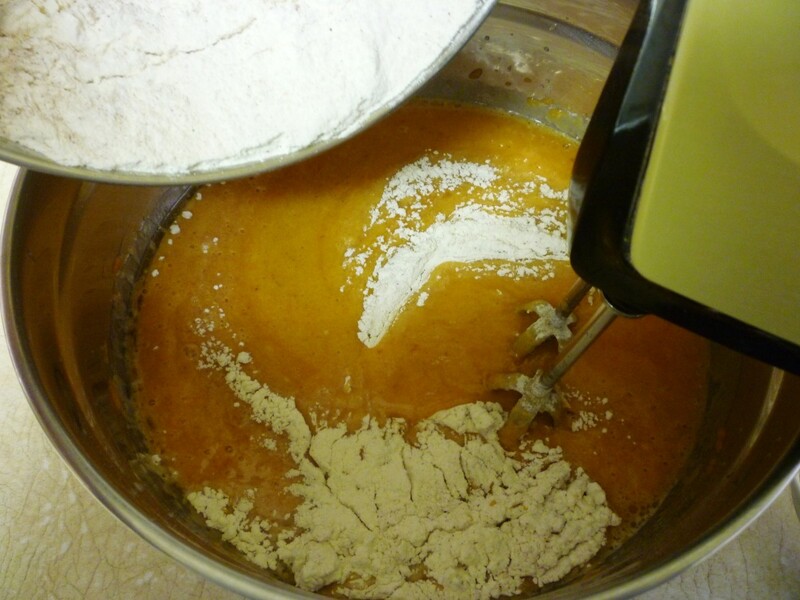 In a large bowl, mix the sugar, salad oil, eggs, pumpkin and water together and blend well. 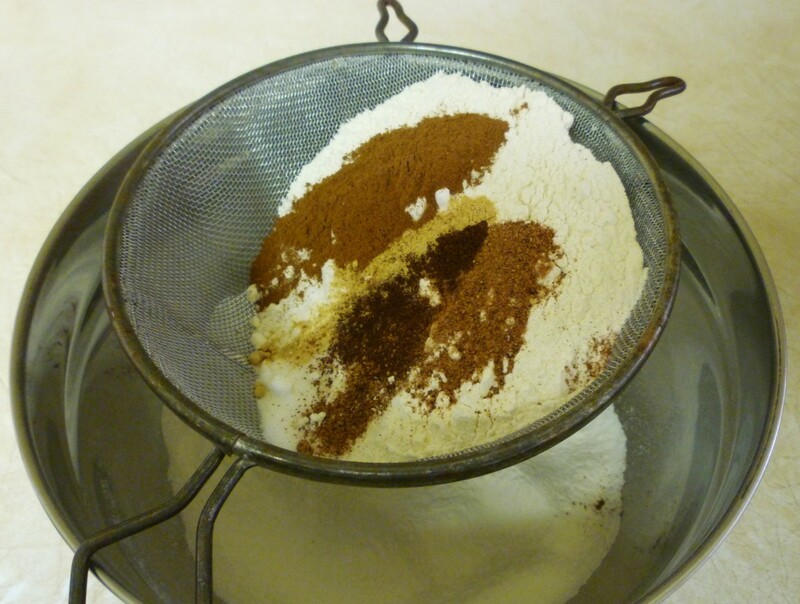 Note: Although the recipe did not call for it, I sifted the flour and spices together. 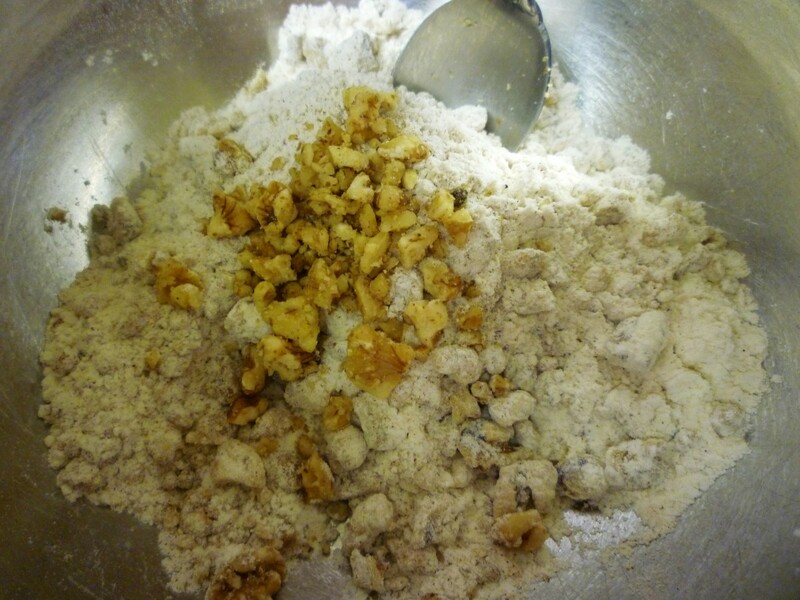 Add the dry ingredients to the liquid mixture saving a bit of the flour mixture to mix with the nuts. Add the nuts mixed with the remaining flour at the end and pour into greased bread pans to bake. I spray my bread pans with Pam. Bake at 350 degrees Fahrenheit for 60 minutes or until a toothpick inserted into the loaf comes out dry. Makes 2 large loaves, 4 medium loaves or 6 small loaves of pumpkin bread. Enjoy the pumpkin bread warm out of the oven or cooled. It is delicious either way! Pumpkin walnut bread sliced and ready to eat. 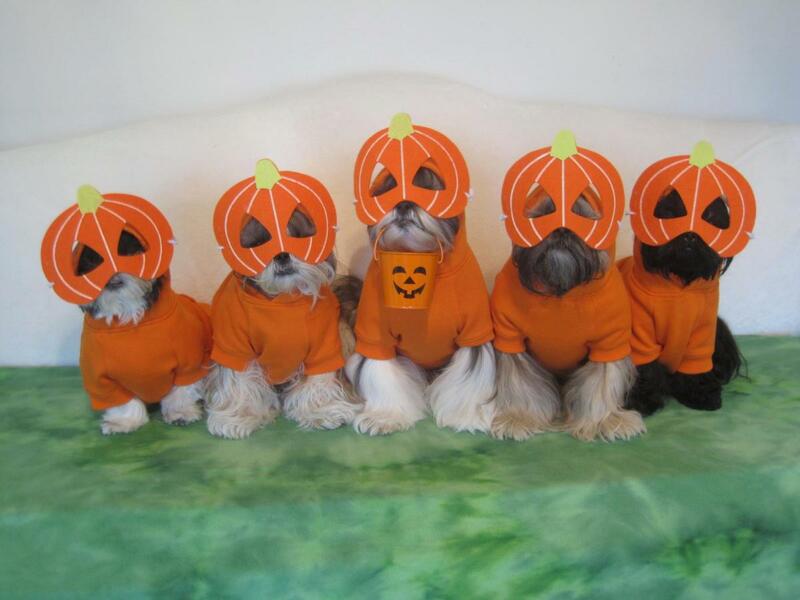 Just for fun...my cousin's Shih Tzu dogs dressed up as pumpkins. 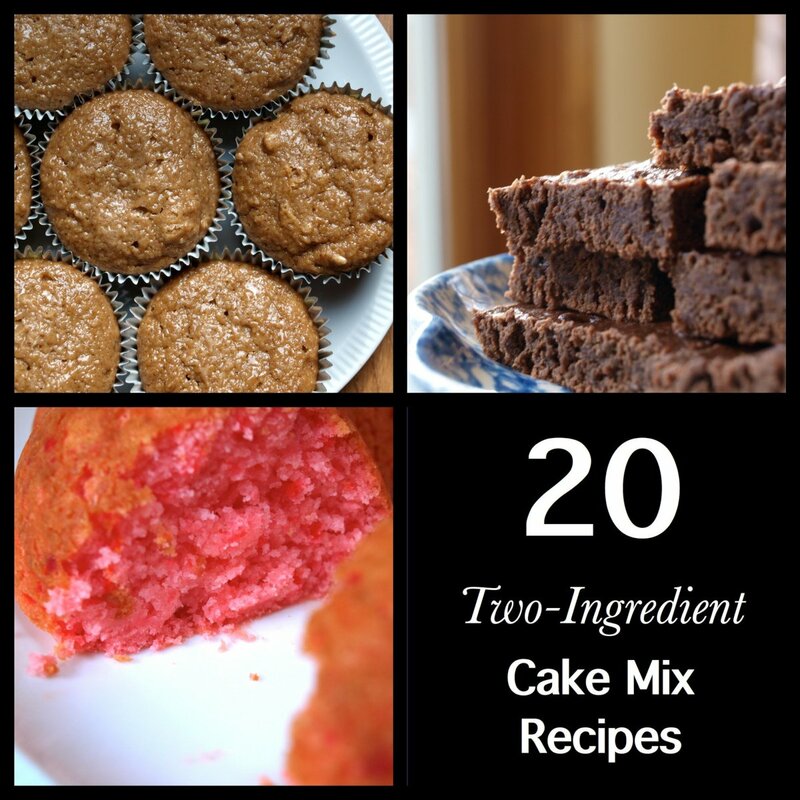 Do you enjoy baking for friends and family? I seldom bake things but enjoy eating homemade baked goods. If I wish to eat baked goods, I purchase them at the grocery store. You are most welcome, Robert. Glad you liked it. 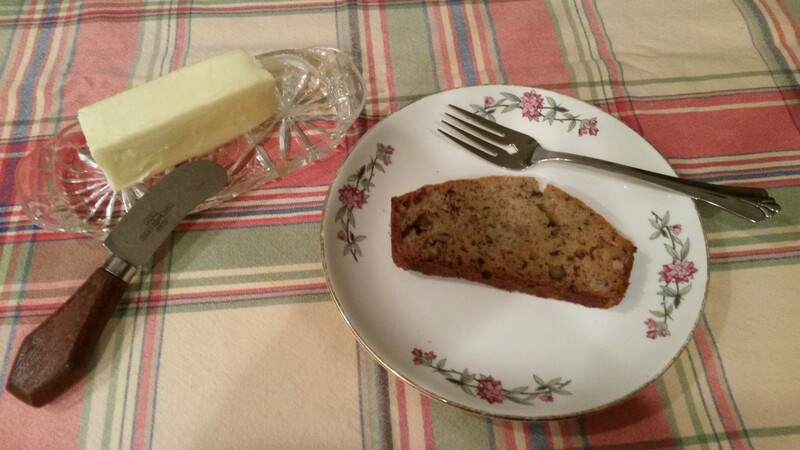 So happy to know that you made and like this pumpkin walnut bread recipe. I made it this evening. It is very good thank you. Happy to be of assistance. Hope they enjoy this recipe. Thanks for the tip. I love cinnamon but my niece and nephew don't so I want to see if I can sub out. If you don't like the flavor of cinnamon you could just skip it. It would still be flavorful with the ginger, cloves, and nutmeg. Since it called for 2 teaspoons of the cinnamon you could just increase the amounts of the other spices a bit to compensate for the lack of cinnamon. Hope this helps! Do you know if there is a reasonable substitute for cinnamon? You are most welcome Robert. Hope you enjoy it. This pumpkin bread is so easy to make and it is delicious. Hope you give it a try. 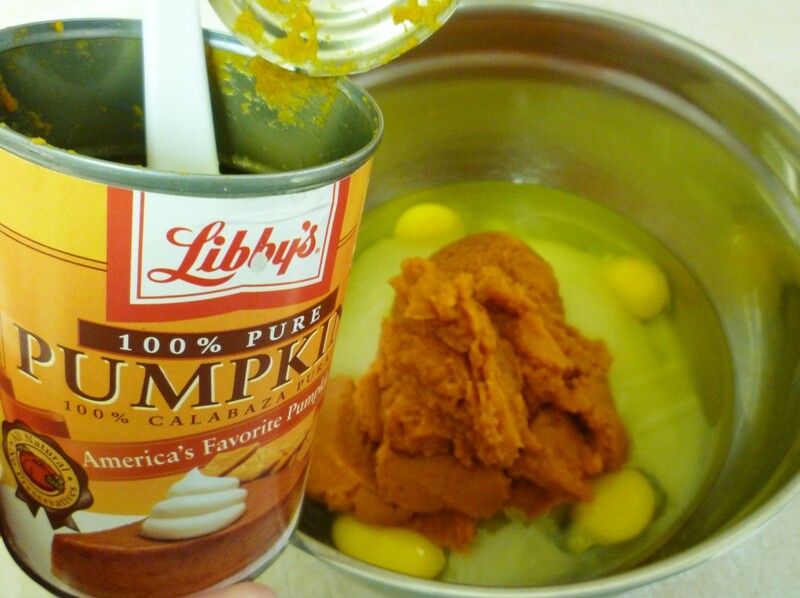 If you have fresh pureed pumpkin it can be substituted for the canned. This seems an interesting recipe. Maybe I'll get the get up and go for this season and try it out. 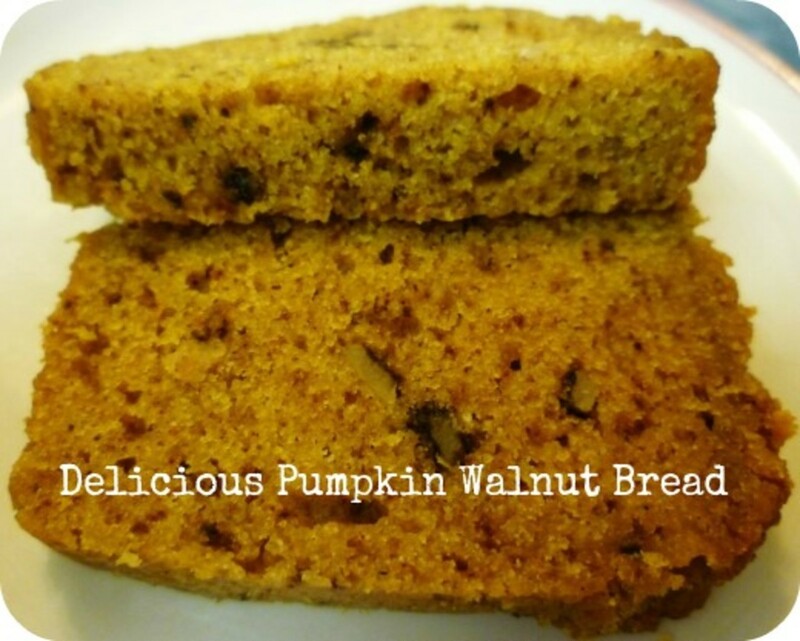 If you like the flavor of pumpkin I am sure that you will enjoy eating this pumpkin walnut bread. Enjoy! This Sounds delicious and I would love to try this. Pumpkin is indeed very nutritious and should be consumed frequently. I haven’t tried it in baking recipes. Glad to have found this recipe. Thanks for sharing the detailed instructions and helpful pictures. This is a perfect bread to be making this time of year. Pumpkin bread also makes for a nice gift item. As to rain in our area, we have had our fair share of it but thankfully no flooding issues in our part of the state. So many people have once again lost homes, cars, etc. I am glad that your sister lives on high ground. 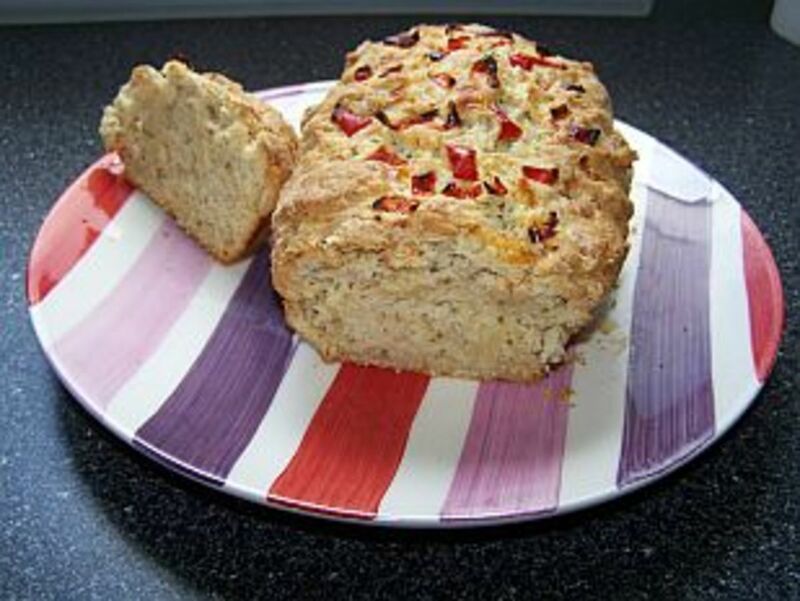 The ingredients are easy to get and this is a really tasty sweet bread. Hope you enjoy it as much as we do! I love it also and it is definitely good year round. Glad you liked the recipe. I love pumpkin bread, nice recipe. This really is easy to make if one has a can of pumpkin on hand and the bread is moist and delicious. Enjoy! Thanks for the share. We have 4 large pumpkins that we are using currently for outdoor decor by our front door but I am ready to start doing some cooking with them. I have always used the canned pumpkin for this bread recipe. Mostly I roast the fresh pumpkins or use them in soups. Enjoy this pumpkin bread recipe! Glad you found this recipe in time for the upcoming holiday season. You are most welcome! Enjoy this delicious pumpkin bread recipe. There are loads of pumpkin patches in Houston also. 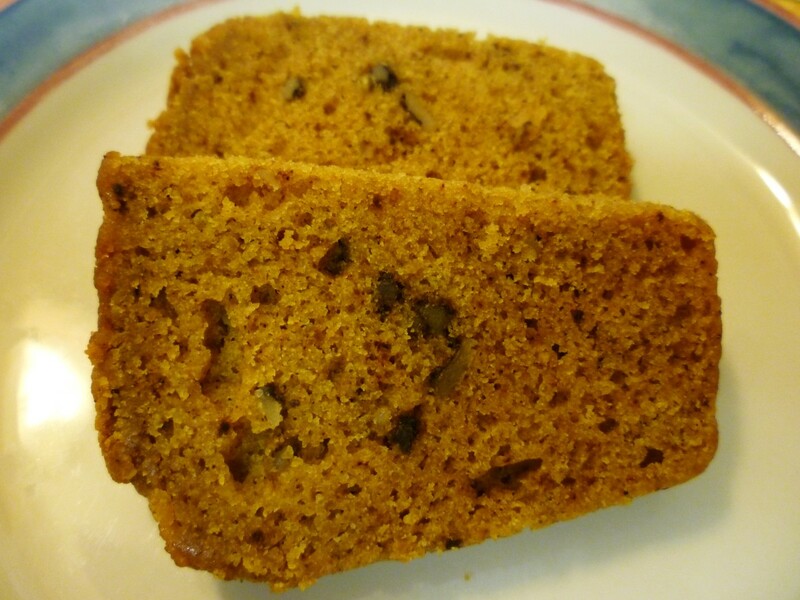 This sounds like a flavorful recipe for a moist pumpkin bread treat, and fast and easy, too. I am wishes I had a can on pumpkin on hand. Sharing to my recipe board and and voting up, Peg. Halloweeen is the perfect time to be thinking of pumpkin bread, and your recipe for pumpkin walnut bread looks delicious and perfect for the season. I haven't been baking much lately, but the cooler weather and the thought of the wonderful smell of spices and pumpkin filling the house has inspired me! Just the recipe for the season that i've been looking for. Thanks! Just came back to read this great recipe for your Pumpkin bread and to share it in time for Thanksgiving! We have a neighborhood pumpkin patch already. With the holidays coming up, this would make a great addition to any menu or party tray. Pinned to Awesome Hubpages and sharing again on HP. With all of our new writers, I'm sure some of them haven't seen this delicious recipe yet! The nuts do add some crunch and good flavor to this pumpkin bread recipe. Enjoy! Appreciate your comment. I love the addition of nuts to pumpkin bread- looks like this recipe made it to my favorites list! This is such an easy recipe to whip up even without a bread making machine. Enjoy! I made some and have already given out some loaves of this delicious pumpkin walnut bread. It is good year round but somehow pumpkin seems so appropriate at this time of year. Hope you had a wonderful Thanksgiving! We gave a loaf of this pumpkin bread to our yardman today who mows and edges our yard along with his check. He seemed pleased. Happy Thanksgiving to you! That looks so yummy that I want to try it out too. My Bread making machine is lying idle for many months now... I may as well make use of it. Time to get cooking again for the holidays!! I bookmarked this recipe, because I'll surely make this. Voted UP and shared all round. So glad that you tried my pumpkin bread recipe and like it. Thanks for letting me know. I think that I will have to make some soon. I gave you five stars for your fabulous pumpkin bread recipe! It was on my list of favorites so we whipped up two loaves yesterday. This bread is just as delicious as it looks in the photos. Thanks so much! Ooh yummy! I love pumpkin bread, may need to try this out - after all one pumpkin bread recipe is simply never enough! Already pinned this to my 'Breads & Pastries' board, but pinned it again, this time to my 'Halloween, Thanksgiving, & Autumn' board. Also voted it up and will share it again with followers since this is a fabulous recipe and it's the time of year that many people enjoy pumpkin in a lot of different recipes. I'm with you, though. I think it's delicious year around! I notice that you are gravitating towards these recipes like this. You must have a sweet tooth? Ha! Thanks for your comment. I love pumpkin bread, this looks so good! Voted up. Peggy, wonderful recipe for a healthy bread. I'm including a link to this hub in my hub on the health benefits of pumpkin. Thanks for sharing. If you like walnut bread and also pumpkin flavors, you should like this bread. Hope you let me know how you like it when you give it a try. Thanks! Pumpkin walnut bread is one of the few things I attempt to bake. The other is banana walnut bread. I just read Rajan's hub about the many health benefits of pumpkin and pumpkin seeds, so I'll probably make more of the pumpkin bread than the banana in future. The spices make it SO good! P.S. The dogs are adorable! I never thought about baking pumpkin bread, my usually usage of pumpkin is in curries, thank you for this idea i'd have to try it. Hopefully it will taste good. I've tried walnut bead before which goes down a treat. Pumpkin bread now that'd be something to share with the neighbours. This is a great recipe and I've come back to pin it to my 'Bread & Pastries' board. Will share again, too. It will be nice to have your own ready supply of pumpkins at your disposal for you to eat and also help feed those goats. Thanks for your votes and the share. Happy 4th of July! So glad that you liked the sound of this pumpkin bread recipe. 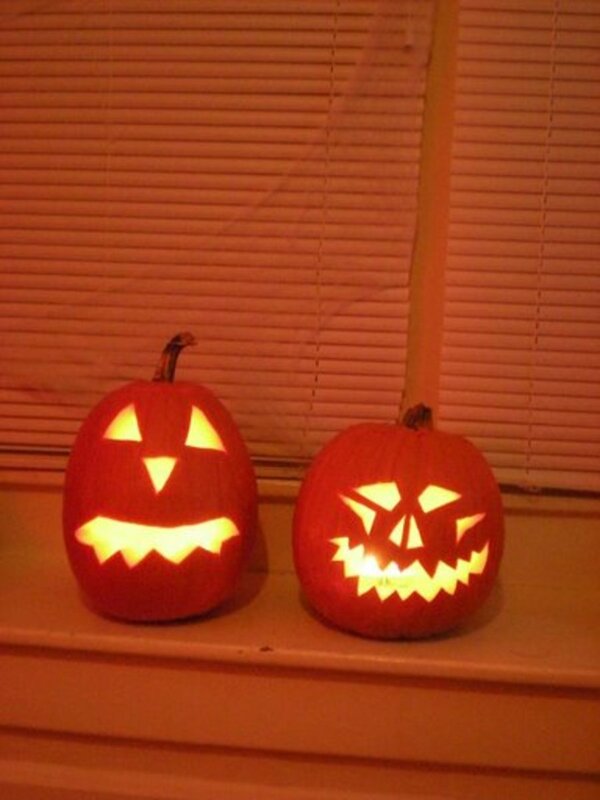 You say that pumpkin is not that popular except for carving in your part of the world. Interesting. Over here it is associated with pumpkin pies at Thanksgiving but is sold year round in canned form. I have used it in soups successfully. Thanks for your comment, up vote and the 5 star rating. From the sound of it, you will be able to provide the Methodist church all the pumpkins they need this coming Fall season for their annual fundraiser. :)) Does your donkey eat any pumpkin? I believe they would eat carrots, so just wondering if you have tried feeding it any raw pumpkin? You should take some pictures of your pumpkin patch this Fall and write a hub about it. Glad that you liked this pumpkin bread recipe. You will surely have an abundance of one of the main ingredients when they all mature. Appreciate your comment and votes. this recipe sounds delicious, I've not used pumpkin much it has only just started being popular over here, and then only for carving. Love all your pictures I'm glad someone else goes to all the trouble that I do for their hubs. I will clip this and store it away! My back yard is going to look like your pumpkin patch photo come fall! Last year the Methodist church gave me and my donkey a dozen bales of straw, a round bale of hay and 25 organic pumpkins all left over from their pumpkin patch event! I just tucked the pumpkins all around the yard and covered them with compost. Now I have pumpkin plants sprouting everywhere! LOL! :D Voted up and useful! Pumpkin bread is delicious. 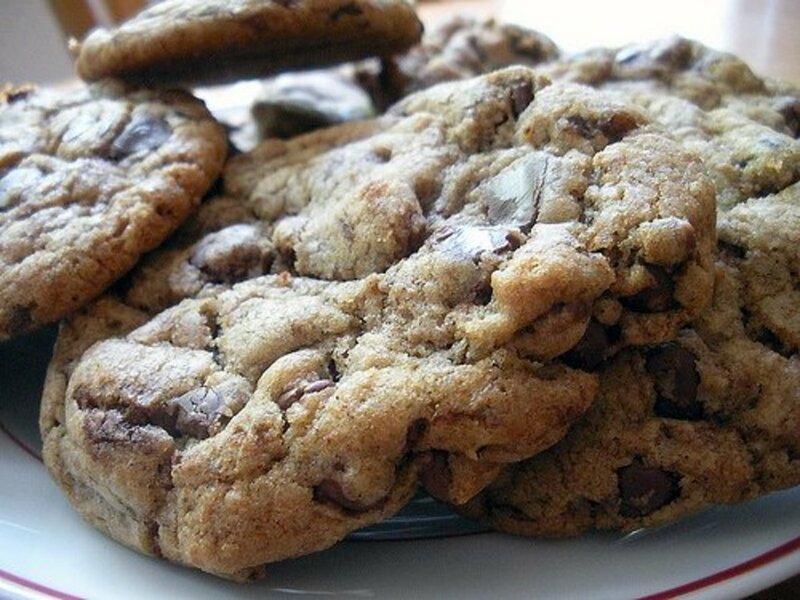 Hope that you like this recipe. Thanks for the pin. Just wanted to check back in to tell you that as I type this, I am eating a warm, butter-slathered slice of your pumpkin walnut bread. I subbed whole wheat flour and added cardamom and allspice, and it is absolutely divine. Even my picky-eater husband has already announced he will have it for breakfast. I'm going to wear this recipe out! I did notice 2/3 cup of water in your ingredient list but didn't see it in the directions (maybe I missed it?) so I added it to the egg/pumpkin mix prior to adding the dry ingredients. I only point it out in case you want to clarify it so no one forgets to add the water at some point -- after all, with such a great recipe it'd be a darned shame if someone didn't have it turn out just as it should! Am sure if you follow this recipe yours will look just the same. Enjoy! and thanks for your comment. Love pumpkin bread have to add this recipe to my pin board. So glad that you like this pumpkin walnut bread recipe. Thanks for your votes and the share. I just cannot wait anymore to have this right now if mine is going to become like the one you have showed in the pic. Nice that you have an abundant supply of fresh pumpkins on hand for your use in recipes like this. Glad that you enjoyed the Shih Tzu photos. :)) Thanks for the votes + share. This looks yummy, voted up, more and shared. I know that you are a dog lover. :)) Thanks for coming back to share and pin this hub. Appreciate it! Nice to know that you will be enjoying this pumpkin walnut bread sometime soon. Since you love pumpkin and walnuts...this will surely please your taste buds! Thanks for your comment and the shares. I just came back to reread this delightful and mouthwatering Hub. I wanted to see those darling dogs again, too! Will share and Pin, too. This looks delicious! I love Pumpkin but have not eaten many here but first got introduced to it living in New Zealand and soon became addicted to it! Walnuts are one of my favorite nuts and love bread with them so this is an all round winner for me. Your photos and instructions as always are great to follow making it all seem so doable and easy. Lovely that it is an old family recipe too! Voted up, Interesting, Useful, Shared and Pinned! i love yr pumpkin cake too. Awesome. Nice to know that you like the sound of this recipe for pumpkin walnut bread. Thanks for your votes and the shares. A wonderful recipe hub! I like pumpkin-based desserts & walnuts a lot. Your recipe is clearly written with helpful step-by-step photos. Your pumpkin-walnut bread looked very inviting! Well-done! 5 stars, what an awesome combination of flavors! I love carrot cake with walnuts, but pumpkin would be even tastier. Shared, tweeted, up, awesome and useful. 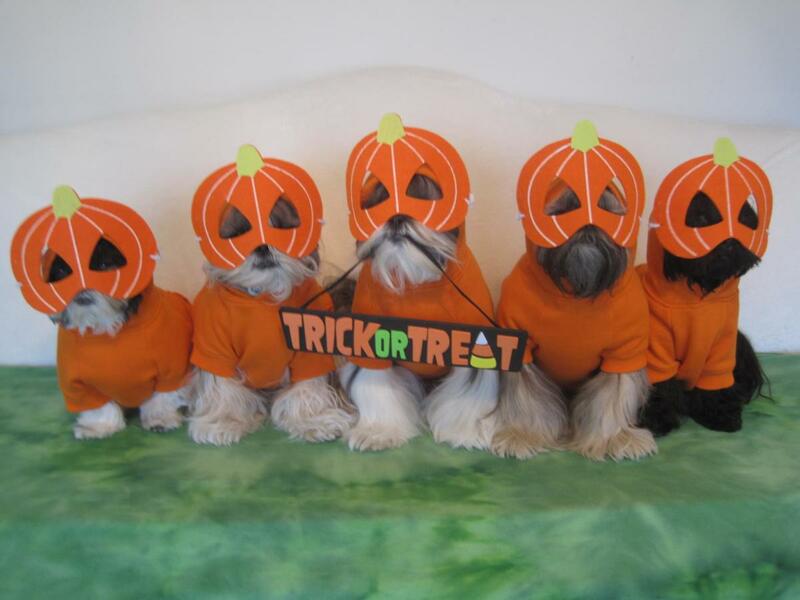 Yes...the Shih Tzu dog photos are so cute. I love adding them to appropriate titled hubs. I am continually amazed at how Judi gets them to all pose like that. Enjoy your pumpkin walnut bread recipe in good health and thanks for your comment. Those dogs cracked me up. They look so cute! Thanks for telling me about this hub. I will most definitely use this recipe soon because the pumpkin is a - waiting! You seem very familiar with pumpkin bread and also the use of light olive oil in baking. This is a very moist bread...and so yummy! 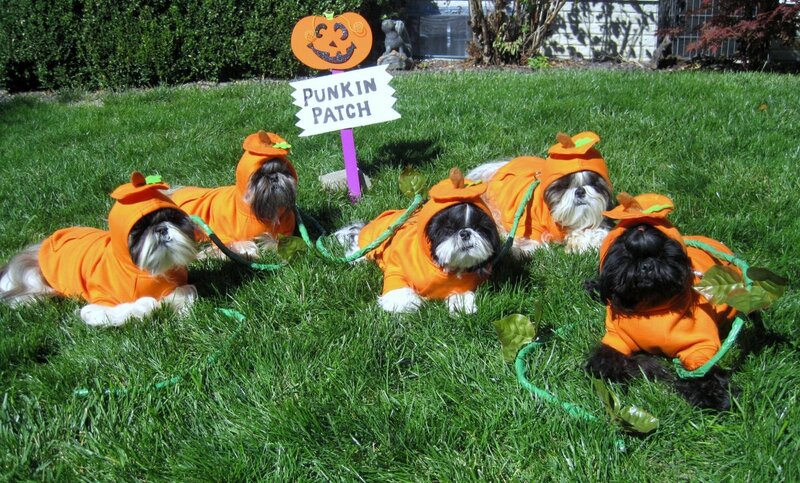 These Shih Tzu photos make me smile. Thanks for your comment. Another sweet bread using light olive oil and more fun shitzu photos, too! Pumpkin bread is one of my favories--it's even better than banana bread--and using oil instead of butter makes for moister bread. Love it! So glad to know that you liked the sound of this pumpkin walnut bread recipe and also learned a bit about the nutrition factor. Thanks for your comment. Am sure that enjoying a slice of this pumpkin walnut bread with some hot apple cider or cinnamon tea would be delicious. Hope you give it a try sometime and report back. Thanks for your comment and votes. Peggy, your opening photo made my mouth water! I love pumpkin recipes and this one is a good one. Thanks for the background on nutrition and the recipe idea. Now here's a combination I've never tried, although I do like both pumpkins and walnuts. I'm wondering what it would be like to have this with hot apple cider or some cinnamon tea. Voting this Up and Useful. Have you never eaten pumpkin bread? If not, I hope that you will give it a try. It is truly delicious and pumpkin is good for one containing fiber and vitamins. Thanks for your comment. Wow! Looks such a delicious treat and with the taste of pumpkin makes it a unique recipe. 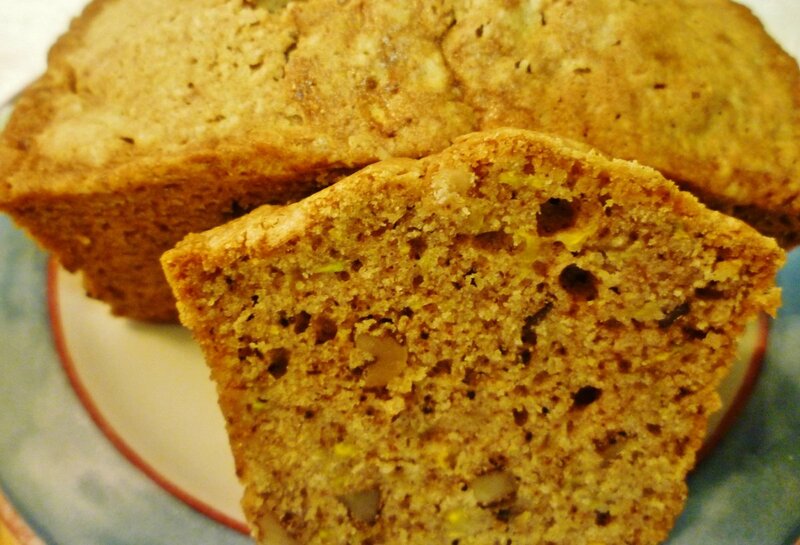 If you like quick bread recipes am sure that you will enjoy this pumpkin walnut bread. Thanks for your comment. nice article about pumpkin walnut bread. i've always loved different types of bread such as cinammon and raisin or just plain cinammon. thanks again for this. voted up. Let's share this mother's recipe book delight with the followers! No reason to only think of enjoying pumpkin bread just during the holidays. 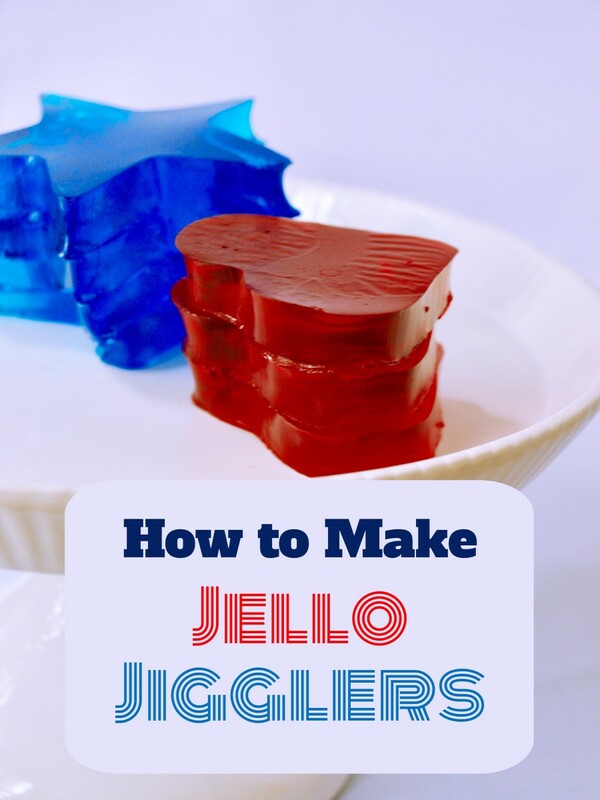 It is a year round treat and easy enough to make. I have never eaten the Starbucks version but am sure it is probably very good since from what you say you are now missing it. Thanks for your comment.